« Are you wining your supply chain battles? Can recessions represent opportunity Part I of II ? Do you know what FedEx, Hewlett-Packard, Disney, Hyatt, MTV, and CNN all have in common? Today’s post is by Mike Figueroa, Account Manager at SafeSourcing. Do you know what FedEx, Hewlett-Packard, Disney, Hyatt, MTV, and CNN all have in common? They were all started during periods of economic recession. Uncertainty in the business landscape can fuel tremendous opportunity. How many corporations are trying to scale down excess inventory and are willing to sell at drastic discount to do it? How many dislocated and highly skilled professionals are willing to accept historically low salaries to find reliable work? How many consumers have drastically changed their purchasing behaviors? To the adaptive go the spoils? That last scenario is the one that frightens retail businesses the most. ociations of discount retail from your primary brand. Opportunity is not exclusive to consumer spending though, it exists also in the new ways consumers are seeking revenue. 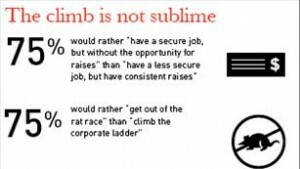 Counterintuitive to what most of us might think about recession-era job seekers, is that there has been a shift in emphasis away from the pursuit of higher pay for potential job seekers. Due to the insecurity the population is feeling however, it should come as no surprise that security is the consistent priority, replacing pay scale as the most sought after characteristic of employment. A 2010 poll by the Associated Press showed 64% of workers under 25 years of age are unhappy with their jobs, and less than half of all Americans are happy with their jobs. What does this mean to employers? There exists opportunity in recruiting talent, and they are looking more for stability than they are looking for large salaries. Of course, savings in production are being pursued just as fervently as savings in acquisition, but everyone can benefit from these savings all along the supply chain. Please check back tomorrow to read part II of Michaels informative post. If you’d like more information about SafeSourcing, please contact a SafeSourcing customer services representative.